Our tents had been baptised by fine African dust. 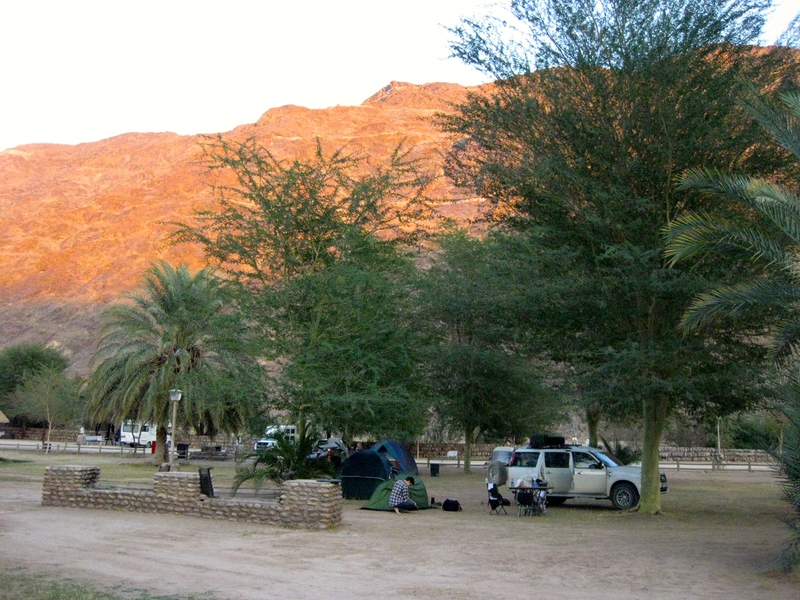 We had spent our first night camping in Namibia’s Fish River Canyon, at the hot springs of Ai-Ais. The camping grounds were unusual. Besides the dusty campground of tents and palms, there was the cavernous Jurassic Park-style visitor’s centre, and a humid indoor pool decorated with waterfalls and potted plants. The most fun was the expansive outdoor pool, heated by the earth below, supporting the growth of a thick layer of slimy green algae on the floor which we slid around on (with a mixture of disgust and curiosity) as we finished beers in the pool. Dwarfing the compound were the great canyon walls, which glowed in pale tangerine as the sun rose. 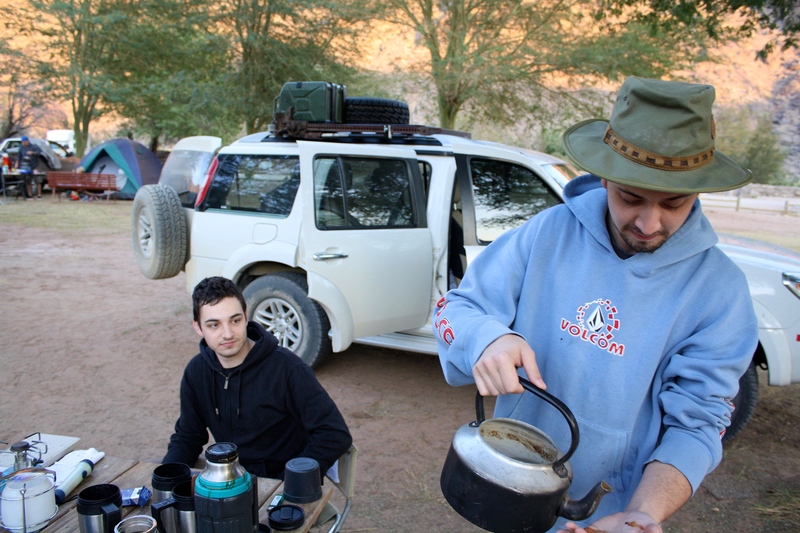 We boiled water over the fire, enjoying the rustic wholesomeness of every flake of ash in our coffee. Jeff didn’t think much of the springs themselves, a small pit of clear, steaming water. A well-boiled lizard was simmering on the surface. He showed his disdain with a half-arsed photo, taken over his shoulder as we walked back to our car. 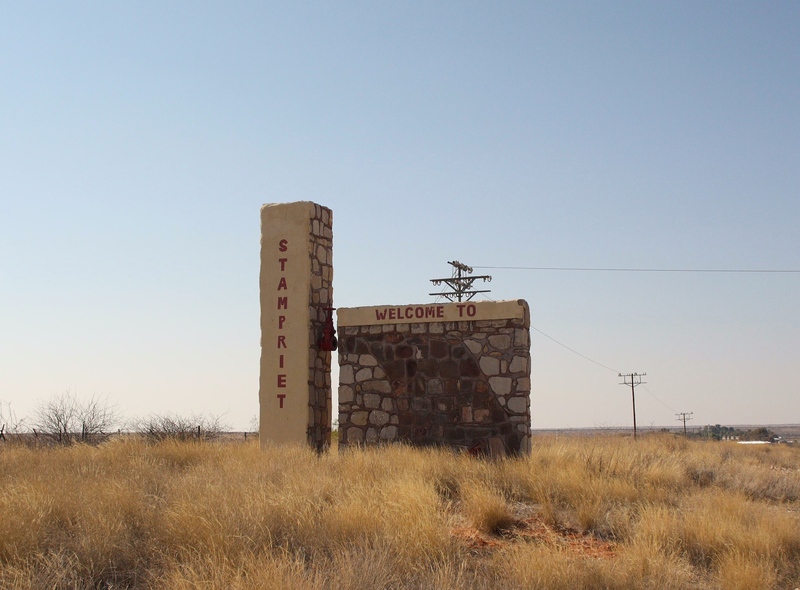 This was Namibia, the undefeated champion of the gravel road to nowhere. The road to Keetmanshoop aimed and fired like a spear directly into the horizon. It was a mesmerising sight. After an hour (of what felt like shaking the car until all the panels fell off) on the gravel, the road mercifully turned to tarmac and we were finally able to reach highway speeds. We were in a good mood so early in the morning, and eager to gain some ground. We were debating our route and border crossing; We could drive to the far north, and pass through the Caprivi strip into northern Botswana. The alternative was to cut into Botswana from the East, giving us more time to spend in the Okavango Delta. 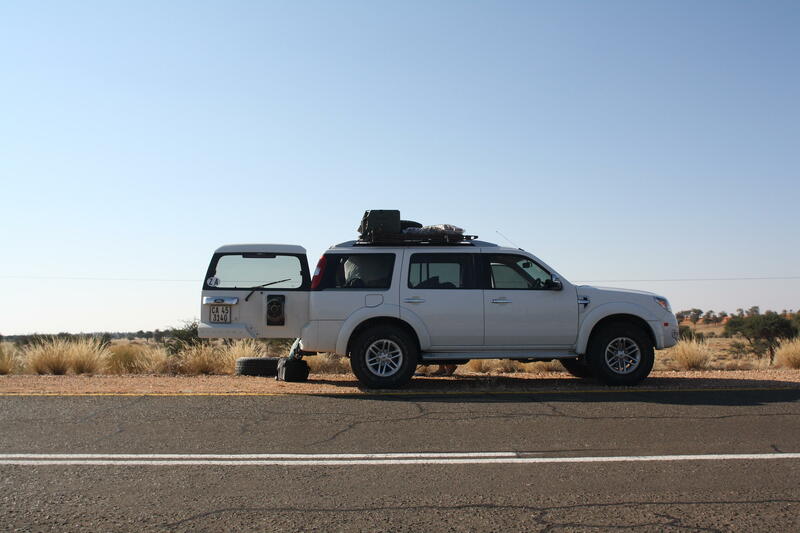 Our first stop of the day was a petrol station just outside of Keetsmanshoop. Jeff walked inside to find a bathroom, Wessel went to buy hamburgers from the Wimpy fast food restaurant, and I stayed at the car. The attendant ran up to the car enthusiastically and started pumping petrol. It seemed so luxurious, having previously always pumped petrol the Australian ‘self-serve’ way. Tank full. Pay. Tip. He started cleaning million insect splatters off the windscreen as Jeff and Wessel returned, bringing hamburgers. We pulled out of the petrol station and gasped at what a difference a clean windscreen made. 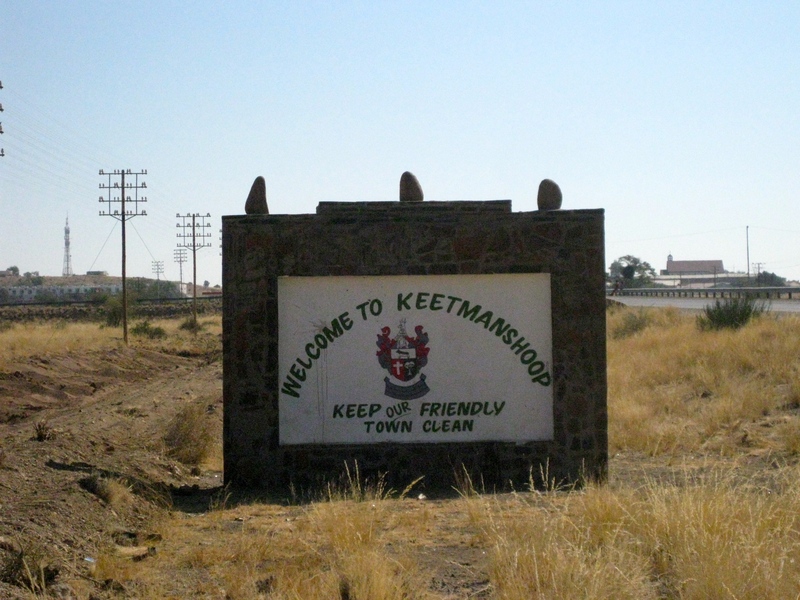 Keetmanshoop was a small crossroads town in southern Namibia, with shops, markets, and large wide open streets in a simple grid pattern. 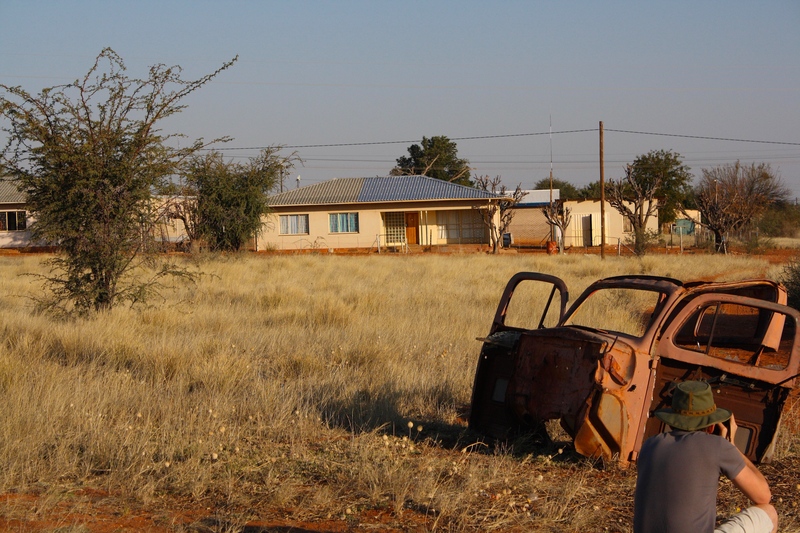 We pulled over in the main street of town and parked outside a bank, our vehicle not entirely inconspicuous among the dusty old pick up trucks and beat-up sedans. I wondered if many ‘adventure vehicles’ passed through this way and if the locals were used to the sight of the fully-loaded white 4WD. Wessel pressed his face against the window of the bank’s front door. Closed. He wandered away to find an ATM a few blocks away. Jeff decided to explore the nearby market. 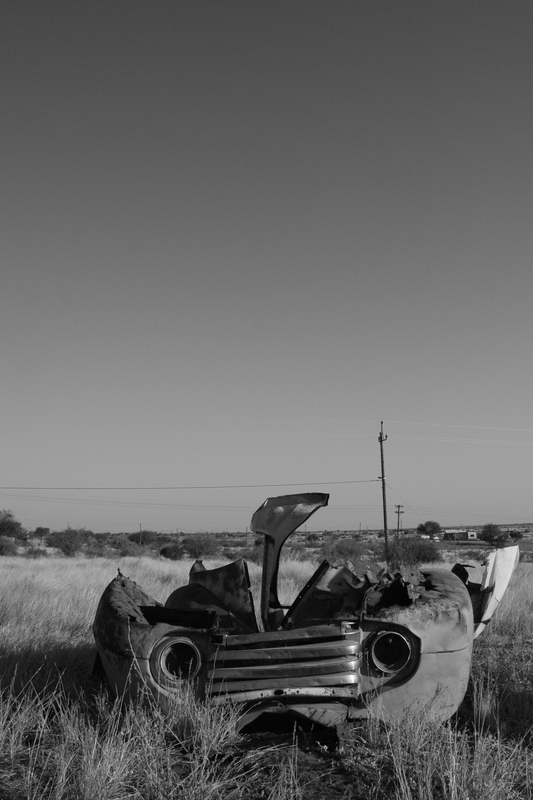 I stayed by the car, looking at the map, watching the people of Keetmanshoop going about their humble business. Jeff returned from the market with a new grandpa-style peaked cap, which he would wear almost every day from then on. Wessel appeared a few minutes later thumbing a wad of Namibian dollars. In the car again, we discussed our next stop and decided to try and reach a campsite at Buitepos, a small town near the border to Botswana where we knew there was a campsite. We had decided to cut into Botswana from the East to cut a few days off the journey and give ourselves allow ourselves more time to reach Zanzibar. I was beginning to love these weird welcome signs to each town. 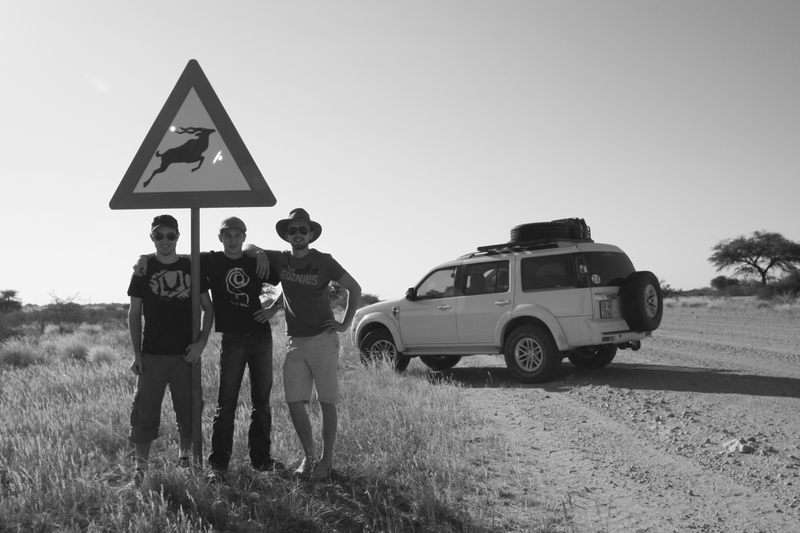 Somewhere between Mariental and Stampkriet, we stopped at a street sign indicating kudu in the area, a species of antelope with stunning spiral-shaped antlers. Out came the tripod, and we soon had our first animal road sign. A tradition was born, and we would go on to collect photos of all kinds of animal road signs, from hippos to warthogs to giraffes. We instantly made a friend in Mariental. A young boy, opportunistic and savvy, he offered to ‘guard’ our car while we were in the supermarket (for a small price, of course). We bought bread, chips, soft drink and beers. We came back to the car and the kid came running back. He wasn’t guarding our car, but doing business with another car. We gave him a few Namibian dollars for the effort. 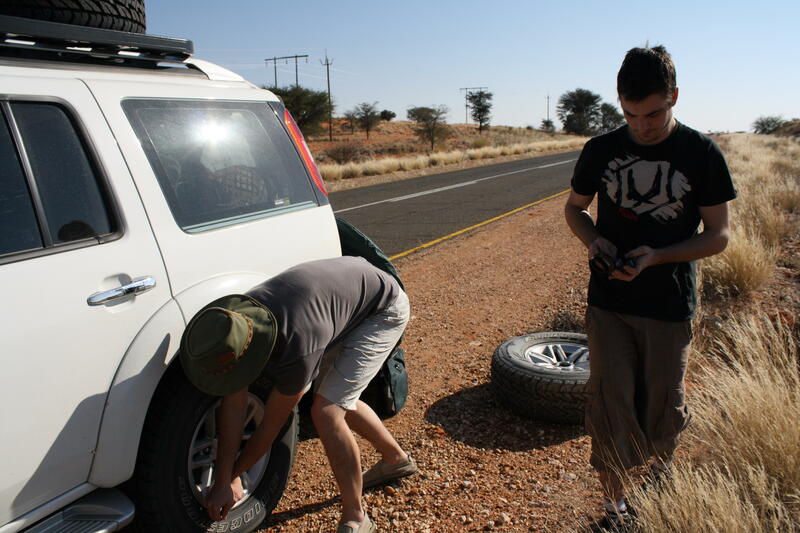 Since we had begun driving we noticed the right rear tyre (a heavy-duty offroad tyre) was constantly in need of pumping. 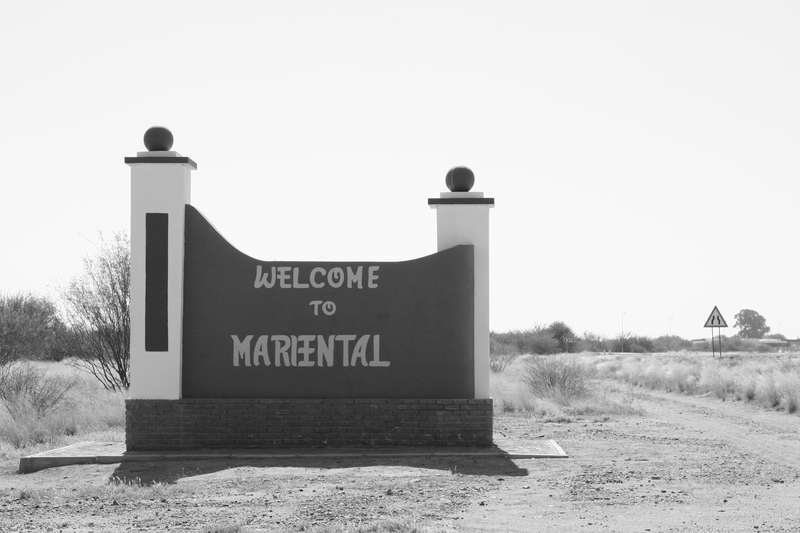 In Mariental, we checked it again. 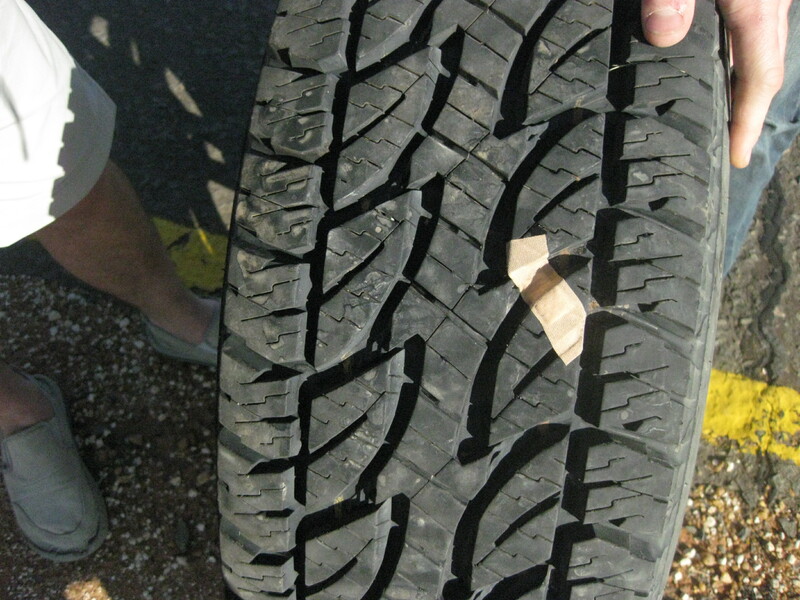 This time we located the huge tear in the tread, and was completely flat. It shouldn’t be; this tyre was designed for punishment and we hadn’t even done tough offroad driving yet. A piece of sharp metal must have done the damage. Wessel and I changed the tyre and Jeff took photos, as the stretch of highway we had stopped on was quite photogenic. We hung the spare on the back and I stuck a bandaid on the tear, to mark where the hole was to later patch it (but mostly for comic effect). I could barely see the road to Botswana, so choked with dust it was. Driving behind any other vehicle was suicidal, and a blind overtake was the only way to get out of their dust storm. We spotted our first wildlife here as a herd of zebra daintily skipped across the road. We eventually reached tiny, deserted Leonardville, and although we didn’t realise at the time, we were on bang on the tropic of Capricorn. 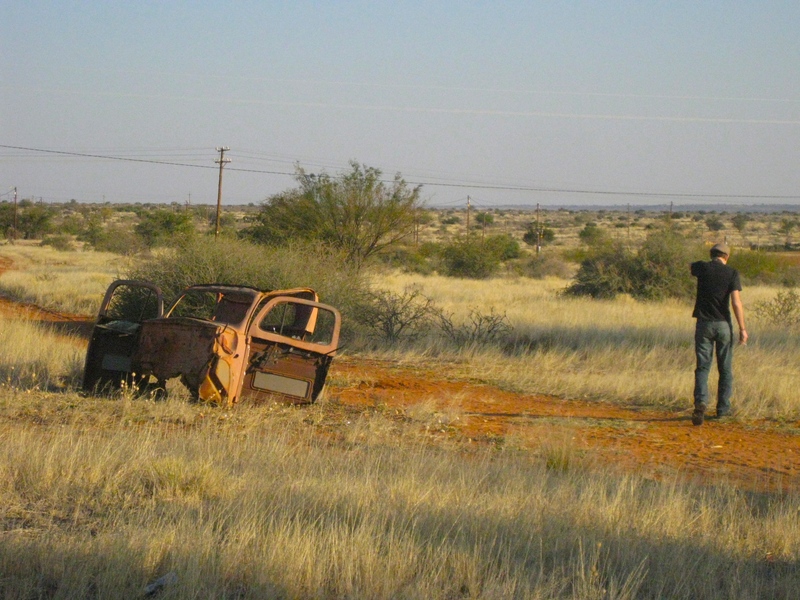 We stopped next to a rusty car graveyard and an abandoned petrol station, and took photos of the derelict cars. A passer-by walked up to Jeff, seemingly the only occupant of Leonardville, and asked for money. We gave him a few coins and off he went. I wondered where he was headed, and I wondered who he thought we were. Down the road was a small convenience shop in the form of a mud brick hut. We bought lollies, water and camp food, and gave some of the lollies to the curious children who were steadily gathering around us. I liked this place in the world very much. We actually took the car of a relative, who lives in Cape Town. We were pretty lucky to have access to it. And yes we did all of our own driving – even if it were a rental car, I would highly recommend it instead of a tour bus! Cool blog. 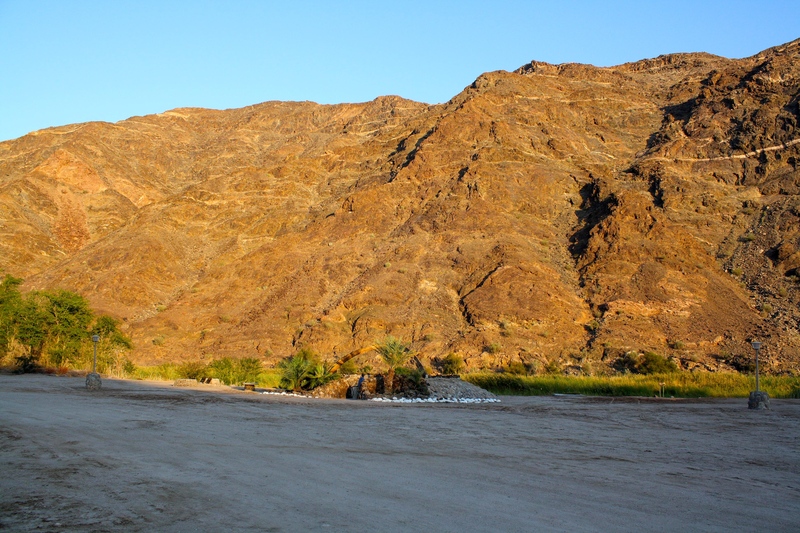 I’ve wanted to visit Namibia for quite a while so it was good to read some info about it. Did you go to the skeleton coast while you were there? No, we didn’t make it out to the skeleton coast, but I wish we would have gone! And the sand dunes of Namibia looked great too, but we didn’t have enough time unfortunately!